Big Billion Day vs Great Indian Sale! Which one can get you more sales? 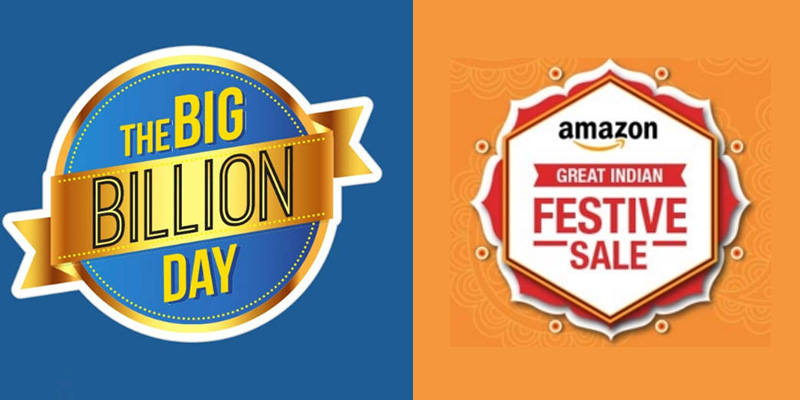 Amazon Great Indian Sale vs. Flipkart Big Billion Day! Which one can get you more sales? It’s already that time of the year! When the two e-commerce giants – Amazon and Flipkart – Go head to head to compete for with their respective sale festivals. Amazon’s Great Indian Festival and Flipkart’s Big Billion Day both take place quarterly where they give massive discounts to shoppers. It’s always a simple choice for a buyer, go where you get the best deal. And it’s easy considering how Amazon and Flipkart are constantly trying to one-up each other. The real tough choice is for the SELLERS! Where should we promote more heavily? How should divide my inventory? Which platform will give me more sales? These are all questions we’re going to answer. Flipkart sold 1.3 million smartphones in the first 20 hours of the big billion day sale opening. Amazon’s highest selling ‘product’ was Amazon’s Prime membership which quadrupled in sales. Flipkart ‘claims’ that they received 70% of the total business during the big billion day. 85% of the new customers were from small cities and towns. It is quite evident that Amazon and Flipkart provide different and unique propositions. Amazon’s Prime service gives them a huge upper hand against Flipkart. Amazon opens their sale 12 hours early specifically for their Prime members (who are often premium customers). This means that a small percentage of customers have already finished shopping before Flipkart’s sale even begins! Simultaneously, based on a recent study, Flipkart was favored for being more ‘trustworthy’ among the two e-commerce behemoths. This means a large percentage of people are shopping from Flipkart because they believe it to be a more legitimate source for high involvement purchases. Which one can get you better sales? Product category – The category that you sell your products in is important while deciding where you sell, For example, if you sell smartphones it is important to sell on the platform that has a higher percentage of mobile phone sales like Amazon since a majority of their sales come from smartphone and appliance sales. Pricing – Similarly, if you sell higher value goods, you’re better off selling on Flipkart. Since it is more trusted, people are likely to be more willing to buy high-value goods online. FBA & Prime – However, if you’re products are fulfilled by Amazon and are delivered by Prime, then Amazon is the way to go. Prime plays a huge role in the purchase decision-making process. So, while it’s difficult to directly know which of the two platforms will give you good sales, you can decipher the better choice, for your products and your brand with some basic research. Make the most of this sale season by working with Sellryt! Sellryt is a leading Amazon Service Provider, who can help you gain access to these new markets. We have partnered with Global brands like Amazon, Shopify, Payoneer and many more. Sellryt specializes in Listing and Cataloging, Cross-border e-commerce and Account management. We can help you enter new global markets and maximize your selling potential on a worldwide scale! Click Here to Get in touch with us and Get a FREE Consultation! Amazon Great Indian Festival 2018 is Here! And Here’s How You Can Boost Your Sales! Amazon’s A9 Algorithm and How Your Products Can Rank on the First Page of Amazon!